Occasionally you will acquire cores of enemies you slay. It is safe to assume items with no rank (Rank—) are monster cores. These can be added to a book that looks like this. The one in your room only lets you view ones you already added. In the hunter's guild as well as the bar, however, there is a person sitting with it open. 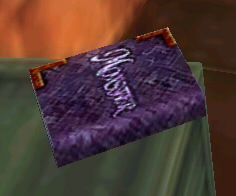 If you pass over cores to them, they will add them to your monster book. After added you can view their stats, as well as practice against them. With the practice map selected, go to game options and there will be a new option at the bottom, allowing you to change which enemy you practice with.